During our Tips on Tuesday segment we like to give as many helpful tips as possible surrounding digital marketing and social media. Today’s tip is a generic one covering all your social media channels. If you have a social media presence, don’t forget to put your social media handles on your marketing literature! Have them on your business cards, flyers, website etc. If you have a presence you want to use it and drive people to find you. Don’t make potential clients or customers work to find you. Make it easy for them and it will pay off! This entry was posted in Tips on Tuesday and tagged Client, customer, Facebook, Google+, Instagram, LinkedIn, Pinterest, Snapchat, social media, Social Media Marketing, Tips On Tuesday, Twitter, YouTube on February 28, 2017 by admin. For today’s Tip on Tuesday we’re going to be looking at Facebook. A small tip today but a very important one. If you’re doing a Facebook update that contains a link, make sure that the link is included in the post before the 5th line of text. The end of the 5th line is where Facebook cuts the post and adds the “See more” action. You want to make following links easy for the people reading so don’t require them to “See more” before they can follow your call to action. This entry was posted in Tips on Tuesday and tagged Call to action, Facebook, followers, social media, Social Media Marketing, Tips On Tuesday on February 21, 2017 by admin. There wasn’t really anything else we could talk about today on Tips on Tuesday – a generic tip to help you out on all your social media channels. So today’s tip is, if you like what someone is doing on social media TELL them. Everyone likes to know they’re impressing someone, so whether it is another business, or an individual pop a comment on. It is a great way of making links and you can be sure that if you say to someone “hey, we love what you’re doing here”, they will look at your profile and take the time to reciprocate. 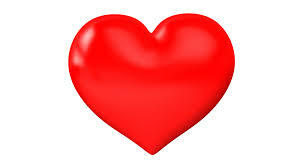 Happy social media love in all! This entry was posted in Tips on Tuesday and tagged Content, customer, Facebook, followers, Google+, Instagram, LinkedIn, marketing, Networking, Pinterest, profiles, social media, Social Media Marketing, Tips On Tuesday, Twitter, Valentine's Day, YouTube on February 14, 2017 by admin. Straight into February with a Tip on Tuesday where we specifically look at Facebook. 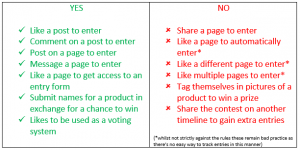 You can only host a competition from a business page timeline or a custom Facebook page/campaign page. Facebook competition must clearly state they’re not endorsed by Facebook and that Facebook cannot be held liable for anything in that regard. Contact your winners in a status update or a comment on the page or send an email to the address provided on entry. So do a competition, have fun with it but do it properly – there’s nothing worse than a competition being pulled because it doesn’t comply with the rules. This entry was posted in Tips on Tuesday and tagged Competition, Contest, Facebook, Likes, Rules, Share, social media, Social Media Marketing, Tips On Tuesday on February 7, 2017 by admin.